Do you remember the time we were given holiday homework in our summer vacations? I remember one of the activities mentioned in the homework for Science were to sprout a seed or bean during the holidays and bring the sapling or the resultant plant to school when the holidays ended. Amongst all the tasks given, which were mainly making charts or models, this one was my favourite. Because I had seen my mother make sprouts at home so many times and tell me and my brother stories of how eating sprouts will make us big and strong. I even remember my elder brother tell me to observe a chickpea closely and how it looked “muscular”. He said that when it sprouted it becomes even more muscular. Gullible that I was (and still am), I believed him and chewed them loudly even though I didn’t like the chalky taste of sprouted Kaale Chane (black chickpeas). I did however love the taste of sprouted moong and moth dal. In the 1990s, my mother would hang a small tea towel or a rumaal filled with soaked beans in a sack above the sink. We were told to run water through the sack when we came to kitchen. My mom, who had a full time job, would often give us simple tasks to do when we were back from school. It was very exciting for us kids to see the sprout shoots pierce their way out through the cloth in just a day or two. And the result of this exercise was delicious. We ate these sprouts mostly in two ways, either with a quick jeera tadka and lemon juice or in a Kachumbar salad with other veggies. I preferred tadka sprouts when we had Kaale Chane sprouts and a salad when we had moth or moong sprouts. My brother however, would just chew them raw. I think even in his mid thirties now, he is as obsessed with sprouts as he was when he was a kid. Old school Cheese cloth or Sprout maker? I too now prefer to eat them raw as I love the crunch. I mostly make sprouts with Moong dal as I find them quick and easy. My mom used to make sprouts in a cheese cloth until the time she bought herself a three tiered Sprout maker that she still uses. I believe her sprout maker would be more than ten years old. It is just a simple box with three compartments. All the compartments have a ribbed texture at the bottom to collect moisture and keep the beans raised. The bottom most compartments carries just a few tablespoons of water. The soaked beans go in the two compartments above so you can make two different kinds of sprouts. 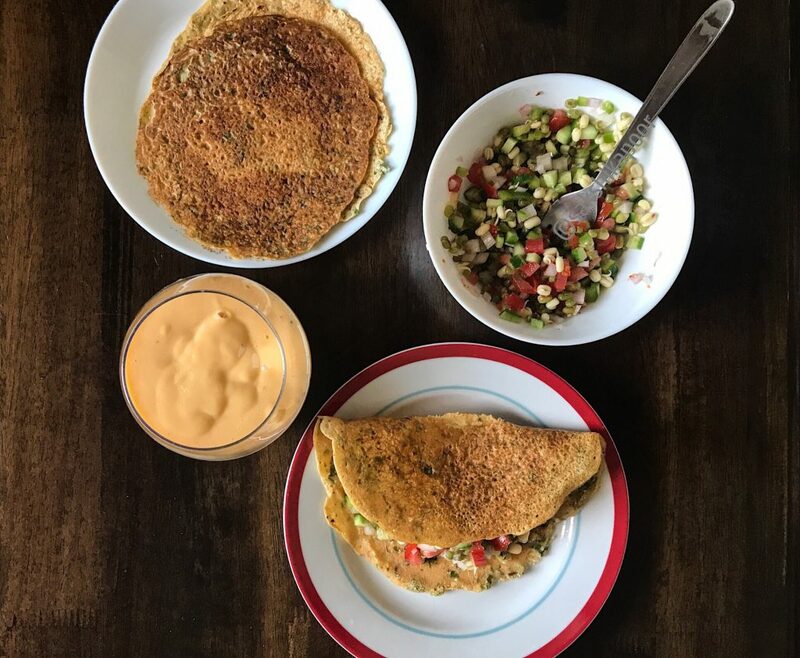 I do not have a sprout maker here in Dubai as I make just small amounts and cannot afford to spare the storage space in the kitchen. My kitchen is a really small space. So I usually make sprouts in a mason jar or a small plastic Tupperware bowl. Whether you have specific equipment for making sprouts or not, you must try making sprouts from your beans as they increase the nutrient content of your beans. And to get the most from these little nutrient rich sprouts, you should ideally eat them uncooked. Sprouts are a great addition to your Salads, Burritos, tacos, soups or anything, really! 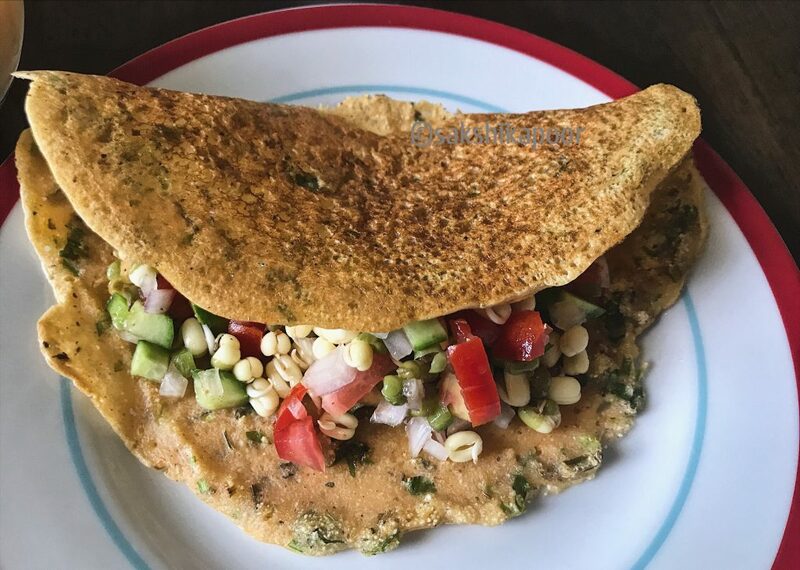 I recently used a Sprout Salad as a filling in a besan cheela for breakfast. What a hearty filling breakfast that was! 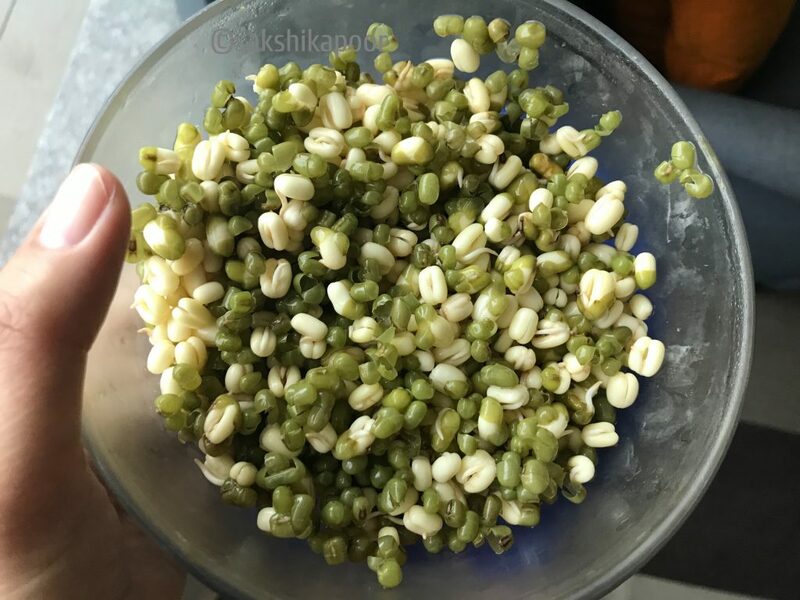 This is how I make a simple Sprout salad with Moong bean sprouts. Making the sprouts takes at least 1-2 days depending on the conditions of your apartment. Start by measuring the moong dal and then rinsing them with water 2-3 times. Now place these in a jar or bowl and soak them with water over night or for 6-8 hours. 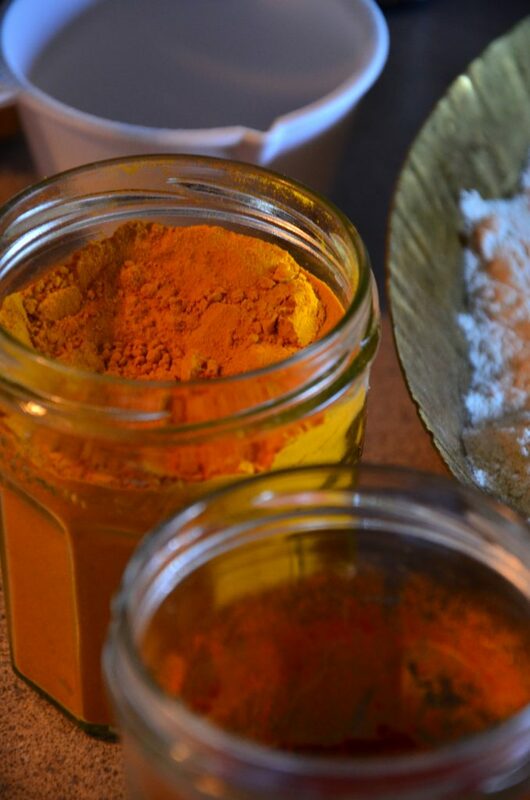 After soaking them for 6-8 hours or more, drain the water and place the moong in a transparent plastic or glass jar. Do not use a very small jar since the dal will be bigger after sprouting and would need space. You could also do this the old school way and tie them in a cheese cloth and hang them over/near the sink if you have such a space. Now place the lid on the jar but don’t close it all the way tightly. You could also tie a muslin cloth on top and secure it with a rubber band. The idea is to let these breathe. Think about how plants need air, water and light to grow! I use a transparent jar so that there is some exposure to light. About the water, I only leave about a teaspoon of water inside the jar. Every 3-4 hours, rinse the moon dal with clean filtered water so that the sprouts stay clear of any smell or mold. I usually rinse them 2-3 times in the day because my kitchen is centrally air conditioned. If your kitchen gets hot or the weather is dry, you would need to run water through them more often. If the weather is cold, then you’ll need to keep them in a slightly warmer, better lit place. In a day or 12-14 hours you should see the moong dal sprouting. Continue to rinse them with water to keep them hydrated and clean. Once you think they have grown, rinse and drain them well and store them in a container in the fridge for upto 2-3 days. Wash all the vegetables and pat them dry. Cut the peeled onions and cucumbers into a fine dice. You may peel the cucumbers depending on your preference. I used English cucumbers and left the peel on. Dice the tomato and place them in a small sieve to drain its juices. Chop the lettuce leave into ribbons or just tear it roughly into bite sized pieces. Chop the washed mint, coriander or parsley leaves if you are using them. Place these veggies with the sprouts in a big salad bowl and toss. If you are using roasted peanuts, you can add them now. In a small bowl, mix the lime juice, olive oil, salt, pepper, red chilli powder together. 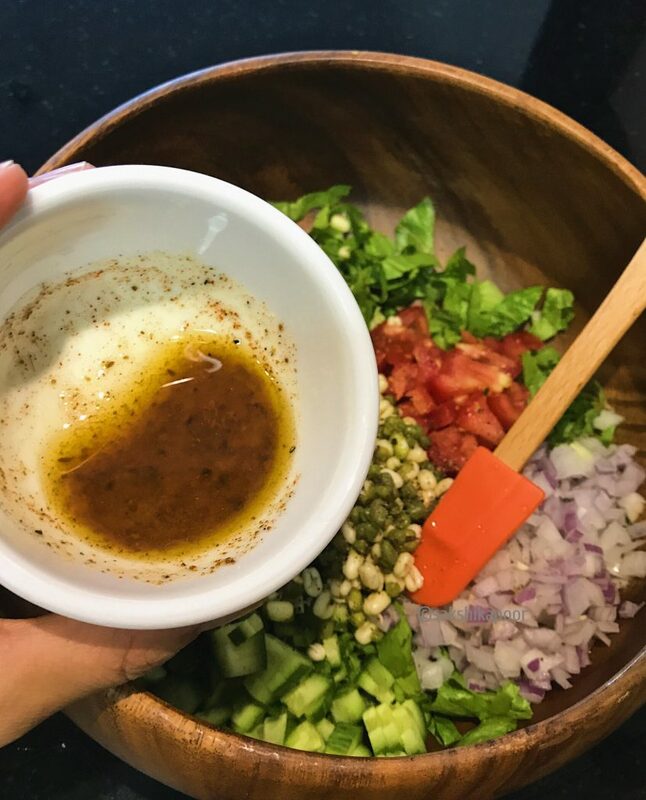 Pour this dressing over the Sprouts and veggies and toss some more. 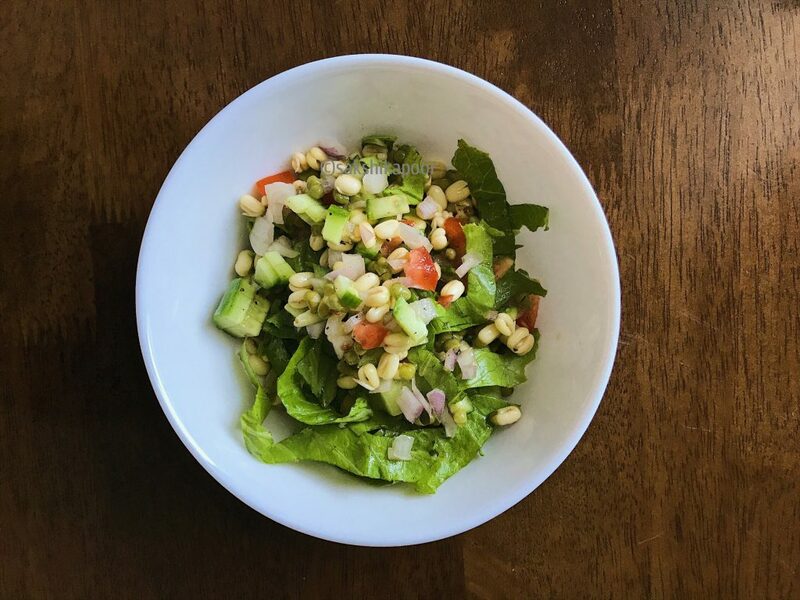 Serve this Simple Sprout Salad in bowls or as a filling for tacos, cheelas or on top of soups. 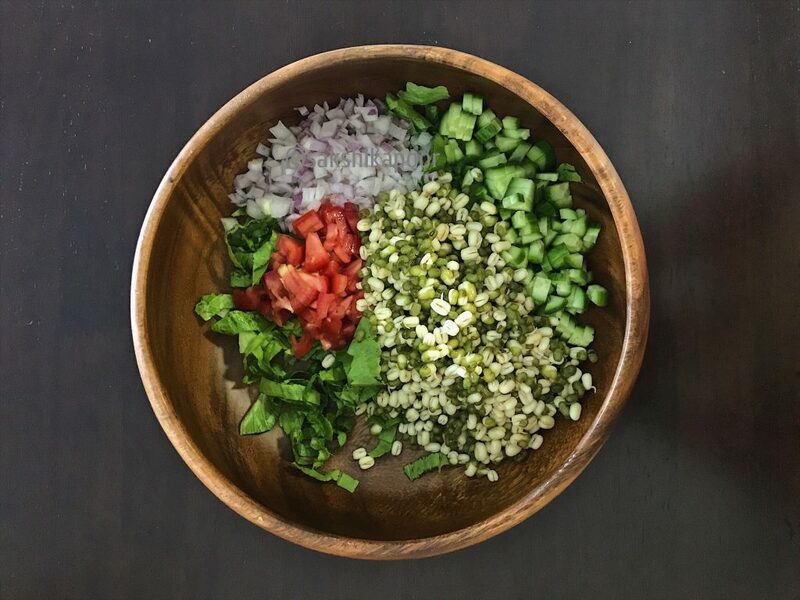 A simple salad made using Moong bean sprouts that were made without the use of any special equipments like sprout makers. After soaking them for 6-8 hours or more, drain the water and place the moong in a transparent plastic or glass jar. Now place the lid on the jar but don't close it all the way tightly. You could also tie a muslin cloth on top and secure it with a rubber band. The idea is to let these breathe. I usually rinse them 2-3 times in the day because my kitchen is centrally air conditioned. Next, chop the washed mint, coriander or parsley leaves if you are using them. Do not use a very small jar since the dal will be bigger after sprouting and would need space. You could also do this the old school way and tie them in a cheese cloth and hang them over/near the sink if you have such a space. If your kitchen gets hot or the weather is dry, you would need to run water through them more often. If the weather is cold, then you'll need to keep them in a slightly warmer, better lit place.